An industry standard within screen protection,the original PanzerGlass TM represents the best in impact and scratch resistance. It is available for virtually every device in the market and constantly developed in parallel with new devices. The original PanzerGlass TM features full touch compatibility, easy installation and a crystal clear viewing experience. The privacy enabled PanzerGlass TM features the same core benefits as the original glass, while protecting also the contents of the display. In order to provide privacy, the glass is transparent only to the user of the device. The glass is not transparent when viewed from the right or the left. The premium PanzerGlass TM represents the most advanced protection and finish available. It is full frame fit and is available in colours matching either the design of the device or an individual personal style. The temp glass is very tough and very difficult to break and can also undergo hammer test. The finish of product and packaging is extremely appealing. The brand has tie up with Cristiano Ronaldo as brand ambassador. We have two variants -one is clear and another is with Privacy feature. THE ORIGINALAn industry standard within screen protection,the original PanzerGlass TM represents the best in impact and scratch resistance. It is available for virtually every device in the market and constantly developed in parallel with new devices. 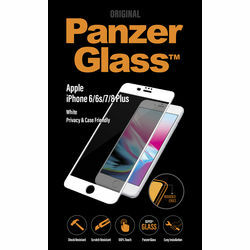 The original PanzerGlass TM features full touch compatibility, easy installation and a crystal clear viewing experience.PRIVACY GLASSThe privacy enabled PanzerGlass TM features the same core benefits as the original glass, while protecting also the contents of the display. In order to provide privacy, the glass is transparent only to the user of the device. The glass is not transparent when viewed from the right or the left.PREMIUM COLOUR COLLECTIONThe premium PanzerGlass TM represents the most advanced protection and finish available. It is full frame fit and is available in colours matching either the design of the device or an individual personal style. OTHER DESCRIPTION The temp glass is very tough and very difficult to break and can also undergo hammer test.The finish of product and packaging is extremely appealing.The brand has tie up with Cristiano Ronaldo as brand ambassador.We have two variants -one is clear and another is with Privacy feature. All information transmitted is intended only for the recipient to which it is addressed and may contain confidential or privileged information, and/or other sensitive material, such as personal data. Any use of this information by other than intended recipients is prohibited. If you receive this in error, please contact the sender and destroy all copies of this information.